You never realize just how much you are reliant to electricity until there is a power failure. Maybe after a big storm or a hurricane. Or it just happens naturally. It’s then that you begin to understand just how boring the world can become. And that’s not even the bad part. Imagine this happens while in the middle of an unsaved project or just when you are about to complete a mission on your favorite game. Lucky you if you were using a laptop but if operating on a desktop then the story is completely different. And just when you thought you have had enough, the power comes back with a surge and completely fries your equipment leading to unprecedented losses. And this time, not even the laptop user will be saved. But all this could have been avoided if you had an Uninterruptible Power Supply (UPS). Not only do they offer you a power back up but also protect your electronics from power mishaps such as over/low voltage and power surges. The CP1500LCD comes with a capacity of 1500va which is the highest capacity in this particular lineup of CyberPower’s intelligent LCD UPS systems. This line interactive UPS weighs 25lbs with a solid design that is best placed on a stable surface or floor. Out of the 12 available power outlets on this UPS the battery backup functionality is only available in 6. However, all the outlets have a suppression rate of 1500 joules that effectively protects connected devices from power surges. Additionally, with data line protection you will not have to worry about power surges traveling through coaxial, telephone and Ethernet cables. The battery backup will be able to run for 12 minutes on half load or 3 minutes on full load which should give you enough time to properly shut down your machines and saves any work in progress. Automatic Voltage Regulation (AVR), is a great feature that corrects any fluctuation in your AC power without having to switch to the UPS’ battery power. As a result, you are guaranteed clean and consistent AC power and a prolonged battery life. The LCD panel is another invaluable feature from where you can observe the battery percentage, estimate runtime and also the current load meaning that the power will not run out for you unexpectedly, therefore defeating its whole purpose. This is further enhanced by audible alarms to notify you when power is almost running out and in case the UPS is faulty. Many devices will totally impress you on paper only for you to get disappointed after purchasing them. However, I can confidently say that the Cyberpower CP1500 is a UPS that truly lives up to its hype. APC is a long-standing name in the manufacture of Uninterruptible Power Sources. 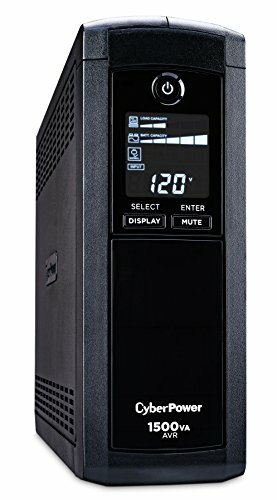 Their products never disappoint and their 1350VA UPS is a testimony to that. With a maximum load of 900W, the BR1350MS is the perfect UPS for home and small office electronics. 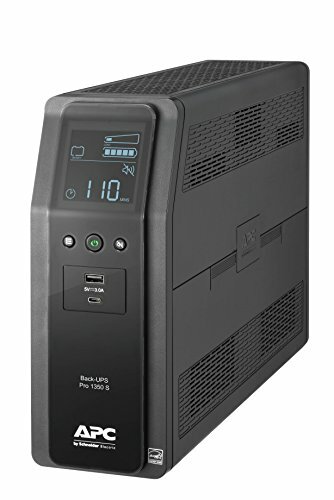 The fact that it is a sinewave UPS means it will efficiently power the high-end electronics like the gaming consoles allowing you to save your game progress before shutting down your devices in the proper manner. It also features an LCD display that is deliberately angled so that you have a better view. From this, you can monitor the battery progress and other power conditions. Automatic Voltage Regulation immediately stabilizes the voltage in instances where it fluctuates beyond the normal level. The APC 1350VA comes equipped with an alarm system to notify you when there are any faults and a dedicated button to switch it off. By connecting the UPS system with the supplied USB you will be able to use the PowerChute software that gives you access to more functionalities like changing the sensitivity settings or disabling the alarm at specific hours. From inclusion of a software program to inclusion of an LCD display, this UPS by APC does not run out of ways to make it the perfect choice as a power back up. And apart from the usual electrical outlets, you can also use the USB ports to charge any USB-compatible device. This is another UPS that is steadily gaining acceptance as an Uninterruptible Power Source. On the front side, there is a rotatable LCD screen for easy viewing regardless of its positioning. This will allow to effectively track the battery capacity and other power conditions. 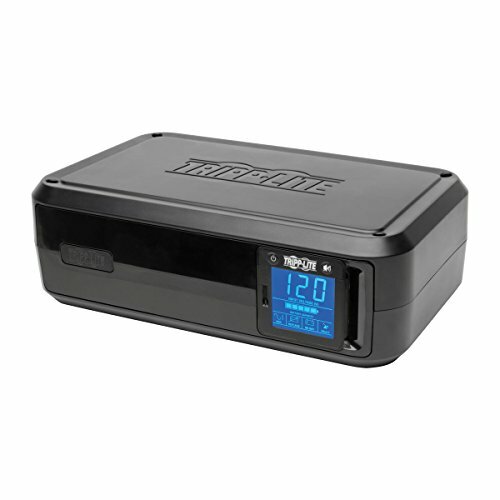 The battery life is quite impressive with the ability to support standard PCs for up to one hour and single VCR/DVR for more than 3 hours after a blackout. AVR ensures that the battery is conserved for use only in critical blackouts by regulating overvoltage and brownouts instead of switching to battery power. The two batteries that come with the UPS can easily be replaced by the user in case they wear out. But considering the generous 3 years warranty on this UPS, I can assure you it will be a long time before this need arises. To top it off you get a $ 250,000-lifetime insurance for any connected device. The Tripp Lite 1000VA comes with eight electrical outlets four of which only offer surge protection while the remaining four offer both surge and UPS power back up. Another highlight feature is the free management software that gives you added functionalities from the UPS like automatic file saving and shut down. But even without the software, you will still be able to perform these functions by connecting the UPS to your PC and utilizing the computer’s built-in power management options. This UPS system is in compliance with RoHS (Restriction of Hazardous Substances) Policy meaning that it’s absolutely safe to use. This also translates to more energy saving less heat and carbon footprint and ultimately lower operating costs. Tripp Lite is an established name with a proven record for producing quality products and you can, therefore, trust their 1000VA UPS to cater to your emergency power needs without any qualms. You will also find its adaptability as both a tower or rackmount UPS as really convenient in choosing the appropriate location. 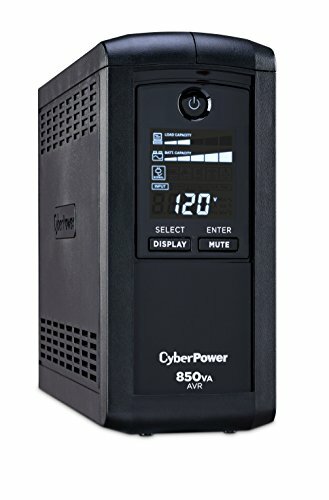 If you are looking for something that’s relatively inexpensive but will still be able to protect your equipment from power surges while still acting as a reliable battery back up then the APC UPS 600VA is your best bet. Labeled at 330W power output this UPS should be able to comfortably power the connected devices long enough for you to properly shut them down. It promises about 4 minutes of run time when drawing full load and about 10 minutes on half load. This UPS system comes with 7 power outlets five of which have the battery back up functionality. 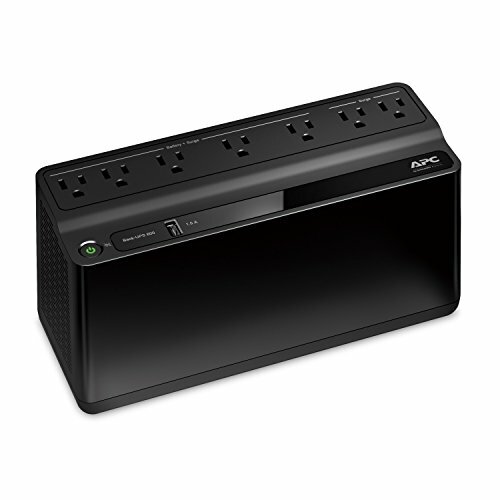 Like all other battery backups by APC, this UPS includes data line protection for power surges that may occur through the Ethernet. It’s also compatible with the PowerChute software that gives you more options to manipulate the UPS. The APC UPS 600VA is powered by a maintenance-free lead-acid battery that you can easily replace in case it becomes non-functional instead of disposing of the whole system. The automatic battery self-test feature ensures you easily notice when the battery is wearing out. Nevertheless, APC has so much faith in their product’s life that they give you a 3-year guarantee and in case your equipment gets destroyed by a power surge while using this UPS system you are covered by the $75,000 connected equipment policy. This UPS might not have the biggest power load but it will really come in handy. With 5 backup power outlets, you have enough room for all the essential equipment like the computer, wireless router to maintain an internet connection or gaming console in case you want to save your game progress. 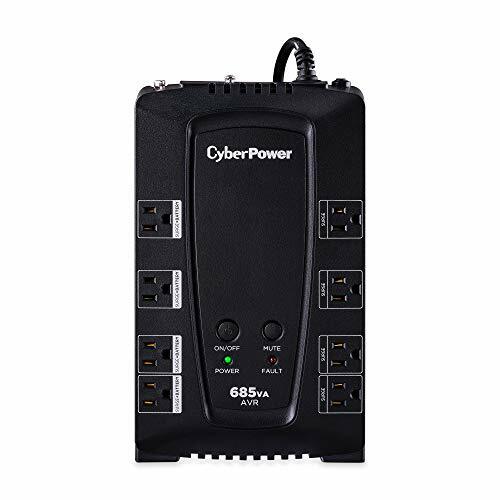 It should not come as a surprise that there is yet another CyberPower UPS system on our list. It’s because you can never go wrong with this brand. The CP685AVRG comes with a maximum load of 390W which is the main distinguishing factor from the CP1500LCD we reviewed above that packs. Well, that and the unique architectural design that allows this UPS to stand both horizontally and vertically. But the small power capacity also means that its significantly less priced making it the best fit for you if you are operating at a small budget. Other features of the CP685AVRG include AVR to correct minor voltage fluctuations, Data Line Protection to prevent power surges that travel through the Ethernet, telephone and coaxial lines and a PowerPanel Management software to enhance the usability of the UPS system. Since this is just a small UPS system there is a limit to what you can expect from it. As a power backup for a lamp or wireless router, you can be assured it will serve you for long. However, for more powerful equipment like the TV or console, you will only have enough time to properly shut them. All in all, it provides an excellent alternative if you have limited funds but still want to keep your equipment safe.